The above video shows how to add icicles to your display. There are two different types of icicle strings. Standard and Pixel. For a more in-depth discussion of string types, see the Common Settings section of the help. Basically, a Standard sting is one where all the lights turn on and off at the same time and their color is fixed. A Pixel string is one that has individually addressed lights that can be any color. Click on the button on the main Vixen window. 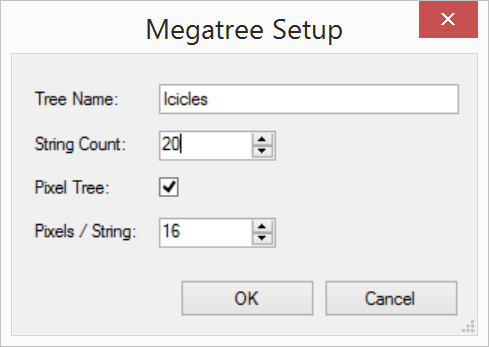 The closest match we have to a pixel icicle string is a Megatree. So, we’re going to add one of those. Select “Mega Tree” next to the Add in the Element Setup box and click the button. 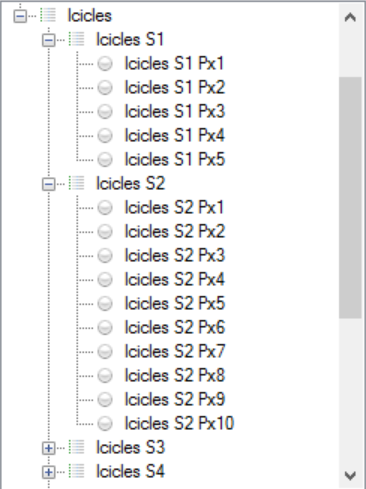 A dialog box will appear that allows you to enter information about your icicle strings. The String Count will be the number of icicle strands in your string and the Pixels/String should be set to the number of pixels in the longest string. 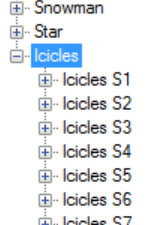 So, if you have icicle strands that are 5, 10 and 16 long, enter 16 here. Now, press OK on the above dialog box and expand the tree so you can see the icicle strand you just created. Next, delete all of the extra pixels that are not needed out of each icicle strand. Press OK to save this strand. Now, load the Preview you would like to edit. To add the icicle strand you just created to the preview, click on the object in the tree on the left (in our case Icicles). Now, click on the button in the top toolbar. Left-click at the starting point of the icicle string in the preview picture, hold the mouse button and drag it to the end point of the icicle strand. Release your mouse button. You’re done!